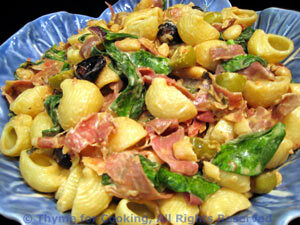 Spinach, Prosciutto, Goat Cheese Pasta, Thyme for Cooking easy pasta. The sauce cooks in less time than the pasta, so if you are using fresh pasta this can go together very quickly. The hot pasta and sauce 'cook' the spinach lightly, so that is just barely wilted. I had both kinds of olives in the fridge, but you can use fewer, or all of one kind. Slice ham into large strips. Sort through the spinach, discarding any damaged leaves, cutting the large leaves in half. Add onions and sauté until tender, about 5 minutes. Add garlic and ham. Sauté for 10 minutes longer, until ham is slightly crispy. Add olives, beans, goat cheese and heat through. Put the spinach on top of the sauce in the skillet, add the hot pasta on top and stir to combine. Sprinkle with cheese, stir again and serve.